Born in Leeds, he was the fifth son of an Irishman from County Mayo and a Yorkshire mother and was educated at Corpus Christi School in the York Road Area of Leeds. A talented footballer he was soon playing for the Leeds City Boys and later represented Yorkshire. As an amateur in April 1958 he opted to play for Leeds Road based Huddersfield Town, rather than Elland Road based Leeds United and continued to work and study to be a draughtsman and with Bill Shankly at the helm he signed professional forms with his club at the age of seventeen. It did not take long for his talents to be recognised at International level. He had made his Town debut in a 0-1 home loss to Bristol Rovers on 18th April 1960, but it was his only game of the 1959-60 season, in which Town finished sixth, he had only played ten games when he was picked to represent England at Under-twenty-three level. Although England lost 0-1, he was partnered at inside-left by Chris Crowe, who had left Leeds for Blackburn not long before, and also in the team were three future World Cup-winners in Gordon Banks, George Cohen and Bobby Moore, while former Leeds Roader Denis Law scored the only goal for Scotland. He became a regular for Town in the next few seasons, scoring his first goal in a 2-2 draw at Stoke City on 24th December 1960 and he went on to score four times in twenty-three League games as well as once in four F.A. Cup ties in his first full season of 1960-61. He maintained his good form with four goals in thirty-eight League games and started two more games in the F.A. Cup as the 1961-62 season saw him almost ever-present, as Town finished in seventh position. He went even better in 1962-63, scoring ten times while missing just one League game as well as playing in Town's sole F.A. Cup game for the season, in which Town improved to sixth. It was also the season when he became one of England's youngest-ever internationals, when only a few days past his twentieth birthday he received the call. He was a surprise choice by Walter Winterbottom in the Home International at Windsor Park Belfast on 20th October 1962. Led by Jimmy Armfield, there were also debuts for Brian Labone of Everton and Freddie Hill of Bolton Wanderers but it was a strong England line-up. Jimmy Greaves put England ahead seven minutes before half-time but Jimmy Armfield, an own goal, or Hugh Barr were credited with the Irish equaliser in the sixty-second minute. However, it was Mike O'Grady that emerged as the match-winner in the final twenty minutes, scoring from a Jimmy Greaves pass in the seventy-first minute to restore the lead to England before putting the game beyond doubt two minutes later to make the final score 3-1. His reward was to be selected for the Football League in a 3-1 win over the Irish League at Carrow Road, Norwich, eleven days later. He was once more on the scoresheet with the second goal in a 6-1 thrashing of Belgium in the Under-Twenty-Three international at Home Park Plymouth on 7th November 1962, a game in which his Huddersfield teammate, Derek Stokes had scored the first. He was selected for England against Wales in the next International at Wembley on 21st November 1962, but had to pull out due to injury and Bobby Tambling replaced him. He was, however, fit enough to take his place in the Football League side on 29th November 1962 and scored the Leagues' first goal in a 3-2 win over the Italian League at Highbury, as John Charles netted both the goals for the Italians. He played his third game for the Football League on 2nd October 1963 when they were defeated 1-2 by the League of Ireland at Dalymount Park, Dublin, a game in which former Leeds player Peter Fitzgerald, then of Waterford, played at outside right for the home team. O'Grady was a classy, dashing and speedy young winger and employed solely at outside-left by Huddersfield, but had such confidence in taking on defenders that he was popular with the fans and also coveted by other clubs. Unfortunately, in the ensuing seasons, he started to pick up injuries which clouded his subsequent career. 1963-64 saw Town slip to twelfth as O'Grady scored three times in twenty-two games and also made thre appearances in the League Cup and, although Town rose to eighth in the 1964-65, with O'Grady netting three goals in twenty-three League games and also playing one F.A. Cup game they were very much in the shadow of the emerging Leeds United had established themselves as a top team in the First Division after being promoted in the previous season. A back injury had seen the dashing winger in and out of the Terriers first team and Bill Shankly tried to entice him to Anfield, but the deal fell through. Don Revie observed the situation with interest and awake to assets that he would bring to Elland Road with his fast raiding and appetite for goals, he paid £30,000 to bring him to Elland Road in October 1965. He scored two goals in twelve League games at Leeds Road in his final part season as well as scoring once in one League Cup game. His final record with Town was twenty six goals in one hundred and sixty League games, one goal in eight F.A. Cup games and one goal in six League games. Some say Leeds had paid dearly for Raich Carter's lack of salesmanship to the young O'Grady, when in his arrogant way he thought it below himself to pursue and obvious talent on his own very doorstep, when Don Revie belatedly tried to rectify his former Hull teammates' mistake at the cost of £30,000. Some may say that after buying such a jewel, he should have been left to sparkle just as other free-spirits, but his natural ability was curbed in favour of the team defensive performance, when he had the ability to beat any defender and threaten any defence. However, he made an immediate impact as Leeds won his debut match at home to Northampton Town by 6-1 and then O'Grady got the winner at Stoke City in a 2-1 win. Although he was primarily an outside left to this point Revie experimented and, in addition to his favourite spot, played him on the Right Wing, Inside Right and even Left Half as he gave Johanessen and Cooper their chance on the left wing. He then won his third Cap at Under-Twenty-Three level as England defeated France 3-0 at Carrow Road Norwich on 3rd November 1965, when Mick Jones, then of Sheffield United got the last two England goals. In his first season he had become a vital cog in the Leeds machine with four goals in twenty-nine League games, one appearance in the F.A. Cup without scoring, and one goal in seven appearances in the Inter-City Fairs Cup. His goal in the Inter-Cities Fairs Cup was a vital one scored at Valencia to take Leeds through to the Quarter-Finals. With Leeds finishing runners-up to Liverpool in the League and reaching the Semi-Finals of the Fairs Cup his efforts would not have gone unnoticed by Alf Ramsey, but unfortunately for O'Grady he was hit by a succession of injuries which hampered him from playing at the peak of his ability and for the next two seasons he could muster only twenty League games and Leeds even contemplated allowing him to move to Northampton. But that all changed as he regained fitness for the 1968-69 season and forced his way back into the first team, missing only four games in the League as Leeds won the championship and he also played seven times in the Fairs Cup as Leeds won the trophy for the first time. His form was such that he also forced his way back into International contention, forming a left wing partnership with debutant clubmate Terry Cooper as Leeds provided three of the team, with Jack Charlton also at Centre-half when England played host to France at Wembley on 12th March 1969. It was O'Grady that opened the scoring in the thirty-third minute with a superb right-foot volley. It was the prelude to a convincing England victory as they rattled in five without reply and they ran riot in the rain with Geoff Hurst bagging a hat-trick, two from the penalty spot, with goals in the forty-eighth minute from the spot, his second, from open play a minute later and another from the spot with ten minutes left, after Francis Lee had scored with a solo effort, five minutes earlier. It looked as though O'Grady had booked his World Cup spot, but Alf Ramsey then decided on his "wingless wonders" team and the rest is history, but O'Grady was never selected again. There was more disappointment at Leeds, where Don Revie also decided to change his winning combination after the purchase of Allan Clarke. This saw Clarke and Mick Jones in tandem as twin strikers and Peter Lorimer moved to a more right wing role than previous, at the expense of O'Grady. This resulted in a transfer request from O'Grady, which, much to the surprise of his adoring Leeds fans, was accepted by Revie. 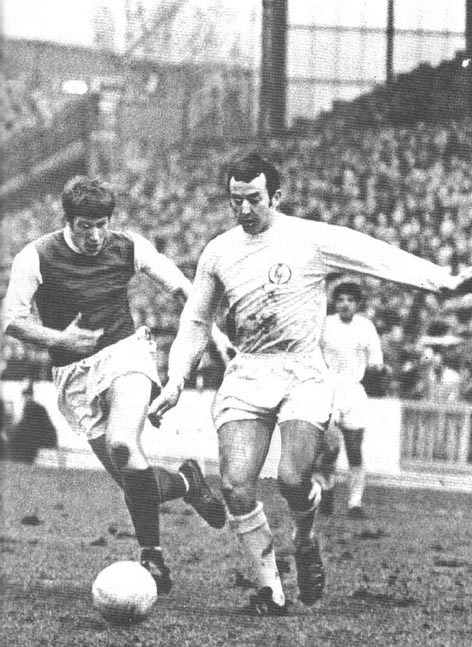 He left Leeds to go to Wolverhampton Wanderers on 22nd September 1969 for £80,000, days after he had scored the first Leeds goal, after thirty-five seconds, in the European Cup massacre of Lyn Oslo by 10-0 on 17th September 1969 and he had played his final Leeds game in a 2-0 home win over Chelsea, three days later, as Peter Lorimer came off the bench to replace Jack Charlton at half-time to score the second Leeds goal. No sooner had he gone to Molineau than he was beset by Knee ligament and Achilles tendon problems. His knee ligament problems stemmed from an over-vigourous tackle in the final minutes of a meaningless friendly at Dunfermline Athletic in December 1969, which was componded by an injury in the gym while recovering from the knee injury. This time it was an Achilles tendon that caused a further lay-off. This meant that he saw very little action that season and rarely completed a game. Hoping to use the close season to recuperate, once more he was disappointed as he broke down again in the pre-season. An operation ensued and it was discovered that the tendon had been torn in two places and it looked like his career was at an end, as it had resulted in his ankle becoming disjointed. He was loaned to Birmingham City in February of 1972 and started twice and made one appearance from the bench without scoring before returning to Molineau. He left for Rotherham United in November 1972 for £9,000. While at Wolves he scored five goals in thirty-three League appearances, and six goals in forty-one appearances in all games. He was rarely at his best for the Millers and did not score his first goal for his new club until the penultimate game of the season on 23rd April 1973 when they went down to Oldham Athletic 2-3 at home as they narrowly failed to avoid relegation to the Fourth Division as he scored once in fourteen League games and also played one F.A. Cup game. It was much the same in 1973/74 as both he and the club struggled in the lowest Division and he took his goals to two and League games to twenty-four and his F.A. Cup appearances to four. He retired at the end of the 1973-74 season and went to work for Yorkshire TV. Then, after eighteen years, when a wave of redundancies came along at YTV, Mike did a bit of freelancing before working at the Royal Oak, Aberford. He also appeared for the United's ex-players team in Charity matches. Now retired he prefers watching his local team Aberford Albion in the West Yorkshire League.